Stroke remains a devastating condition and is currently the third most common cause of death in the United Kingdom. Advancements in clinical practice facilitate the urgent assessment, investigation and treatment of patients presenting with a transient ischaemic attack or stroke. A TIA is a sudden loss of localised brain (cerebral) function with symptoms lasting less than 24 hours with a full recovery. A stroke is a sudden loss of localised brain (cerebral) function with symptoms lasting more than 24 hours with subsequent resolution, symptoms that continue to persist long after the initial event or if an area of abnormality from the stroke is identified on a brain scan. What are the cerebrovascular symptoms associated with a TIA or stroke? Patients may present with clearly obvious abnormalities such as an inability to speak properly, facial drooping or loss of power and sensation in their arms or legs. Some patients may describe solitary or recurrent episodes of visual loss “like a set of curtains coming downwards” called Amaurosis Fugax . How does stroke affect people in the UK? Stroke is the third most common cause of death responsible for 12% of UK deaths. 125,000 people suffer their first stroke each year while 36,000 suffer a TIA each year. Half of strokes affect patients greater than 75 years of age accounting for 10% of in-patient hospital bed occupation and 5% of health care expenditure. A stroke occurs when an area of the brain is starved of oxygen. The brain is unable to store oxygen like other parts of the body and is totally reliant on a continuous blood supply to provide it with nutrients and remove waste. Brain cells can survive 3 to 4 minutes without oxygen before they begin to die. 80% of strokes are due to a sudden reduction in blood flow, called ischaemia, often due to narrowing in a blood vessel supplying the brain or passage of a clot from elsewhere in the body that blocks one of the arteries supplying the brain. 20% of strokes are due to bleeding (haemorrhage) which can occur spontaneously, due to a trauma or as a sudden consequence of an underlying abnormality in the brain such as an aneurysm. What blood vessels supply the brain? Patients have a left and right carotid artery located at the front of the neck where blood flow from the heart travels to the front and middle areas of the brain. There are a further set of vessels on either side at the back of the neck called vertebral arteries which travel within spaces in spine bones and supply back (posterior) areas of the brain. What is a Carotid Stenosis? Narrowing within the carotid arteries is called a “carotid stenosis”. Carotid stenosis can be identified in 3% of women and 4% of men over the age of 50. How does a carotid stenosis develop? Narrowing of the carotid arteries is caused by “atheroma” . Atheroma is a fatty material (known as a “plaque”) that develops within the lining of artery walls in a process called “atherosclerosis” equivalent to “furring up”. All people will develop small amounts of atheroma in their arteries during their lifetime but patients with certain risk factors form extensive plaques more quickly. As increasing amounts of atheroma are laid down it causes the artery wall to bulge inwards leading to turbulent blood flow. Sometimes this turbulent blood flow causes atheroma fragments to break off and travel elsewhere in the brain leading to a TIA or stroke. In time the artery can even become blocked by atheroma thereby limiting the amount of blood that can flow down the artery. Such a reduction in blood flow may lead to a TIA or stroke as well. Patients can have more than one narrowing or blockage within the same artery. What are the risk factors for the development of a carotid stenosis? The risk of a TIA or stroke increases with age but they do occur in younger people who smoke and who have diabetes. Although men are at a higher risk of having a stroke, women are a greater risk of dying from a stroke. Carotid artery disease has a higher occurrence rate in patients with arterial disease elsewhere in the body such as the heart (angina or heart attack), abdomen (aortic aneurysm) or lower limbs (peripheral arterial disease). Other risk factors, which cannot be altered, include a strong family history of cardiac disease or stroke, early menopause in women and certain Asian ethnic ancestry. Modifiable risk factors which the patient can receive treatment for include high blood pressure (hypertension), high levels of cholesterol and triglyceride (fat) in the blood and renal impairment. Patients may reduce their risk through alterations in diet, alcohol intake and physical activity. Why does a carotid stenosis lead to symptoms of a TIA and/or stroke? Carotid artery plaque can vary between patients where the degree of narrowing or relative stability can affect the rate of subsequent plaque rupture and release of clots of fatty material into the circulation. Furthermore, blood flow through a narrowed carotid artery junction can be turbulent triggering further atheroma fragments to break off towards the brain where they eventually lodge and block small arteries. As a result specific parts of the brain do not receive blood so their cells are starved of oxygen and begin to die. If the blockage is quickly dislodged or broken down before cells die, then a TIA will result, but if it is not then a stroke will develop. What severity of carotid stenosis can lead to symptoms of a TIA and/or stroke? Although carotid artery stenosis can be identified in 3% of women and 4% of men over the age of 50, not all patients with arterial narrowing develop symptoms. The risk of a cerebrovascular event is increased when a moderate (>50%) or severe (>70%) stenosis is present which accounts for 20% to 30% of all TIAs and strokes. How is a stroke or TIA diagnosed? Although some patients may attend their general practitioner, most patients actually call 999 and attend their hospital emergency department with symptoms described above such as a sudden speech abnormality, facial or limb weakness. During your initial assessment, the clinician will evaluate your pulse, blood pressure and oxygen levels and stabilise these factors as required. A thorough history of your symptoms and details regarding your medical history will be obtained including cardiovascular risk factors. A list of your current medications is helpful. Your clinician will then complete a “neurological” examination to test the function of nerves supplying the arms, legs and face. You will also have an evaluation of the rest of your cardiovascular system. What investigations happen after a TIA or Stroke? Following your clinical evaluation, you will have a series of blood tests completed as well as a tracing of your heart called an electrocardiogram (ECG) . A CT scan of your brain will be arranged during your initial attendance to look for any abnormality such as a bleed in your brain. A carotid duplex ultrasound scan is usually performed within 24-hours to determine if you have any narrowing in the blood vessels in your neck and occasionally an echocardiogram is warranted to look for a potential source of a clot that may have travelled from the heart to the brain. What treatment is required after a TIA or Stroke? Your clinician will discuss your scan results with you and recommend the most appropriate treatment which may require a referral to a stroke specialist. During your initial presentation, it is important to perform an urgent CT scan of your brain to identify if a bleed has occurred. If a bleed in the brain has been ruled out, your stroke specialist will determine if you are suitable for arterial lysis treatment which involves an injection of clot dissolving medicine through a cannula in one of your veins or whether you require a procedure in the radiology department to try and remove the clot with keyhole techniques inserted via your femoral artery located in your groin area. Most patients are subsequently commenced on best medical therapy which includes antiplatelet treatment (aspirin or clopidogrel) to thin the blood and lipid lowering medications (statins) to limit plaque progression. High dose aspirin 300mg antiplatelet treatment once a day is often prescribed for the first 2 weeks prior to switching over to clopidogrel 75mg once a day. These tablets will also have a protective effect for other cardiovascular systems in your body and will usually be required for the rest of your life. Your risk factor profile should also be optimised particularly blood pressure control and smoking cessation. What therapeutic interventions can be performed following a stroke? As previously described, your stroke specialist may recommend clot dissolving treatment called lysis injected into one of your veins or an intervention in the radiology department to actually remove the clot in the brain directly called clot retrieval (thrombectomy). In the presence of a significant narrowing in the carotid artery, a carotid endarterectomy may be warranted. Occasionally, a carotid stent may be suggested in patients with a history of previous carotid surgery or a previous history of other head and neck treatment such as radiotherapy. Why do I need to see a Vascular Surgeon if I have had a TIA or Stroke? If you have had a proven TIA or stroke and your carotid duplex ultrasound scan reports an arterial narrowing greater than 50%, your clinician will refer you to a vascular surgeon to evaluate whether this area of narrowing is amenable to surgery and whether you would benefit from an operation to clean the artery out called a “carotid endarterectomy” . Current guidelines suggest that if you are medically fit for surgery, this should be performed within two weeks of your initial symptoms. A carotid endarterectomy (CEA) has been the standard surgical treatment for symptomatic, significant carotid disease since the 1950s. Is a carotid endarterectomy a successful procedure? Many large clinical trials published in the medical literature have shown significant reductions in stroke and death rates for symptomatic patients undergoing carotid endarterectomy compared to symptomatic patients who do not undergo surgery. Carotid endarterectomy has been shown to result in a subsequent reduction in the estimated 2 year risk of stroke or death by more than 80 percent, from a ratio greater than 1 in 4 to a ratio less than 1 in 10. Although all symptomatic patients with a stenosis greater than 50% benefit from surgery, patients with higher grades of narrowing greater than 70% benefit even more. Do I need a Carotid Endarterectomy if I have a carotid stenosis but no symptoms or symptoms that occurred more than 3 months ago? Most, if not all, recent clinical studies have confirmed that only recently symptomatic patients receive benefit from carotid endarterectomy. The risk of stroke from surgery significantly outweighs any potential benefits in patients who have never had a cerebrovascular event – essentially this means that you won’t reduce, in fact you may increase, your risk of stroke with surgery if you have never had a TIA or stroke. The same rationale applies if your cerebrovascular event was more than three months previous where the benefits of surgery do not outweigh the risks. However, there are a few indications where your vascular specialist may consider a carotid endarterectomy in the absence of cerebrovascular symptoms; a) if you have very severe disease on one carotid area and the other side is blocked or b) if you have severe narrowing of both carotids and require coronary artery bypass grafting following a heart attack or if you have severe angina. Carotid endarterectomy is an established surgical treatment option for symptomatic patients with a carotid stenosis greater than 50% to reduce the risk of further cerebrovascular events and minimise mortality rates. Bleeding – during your carotid endarterectomy you will receive blood thinning medication to reduce the risk of heart complications and formation of blood clots elsewhere in your body. Your vascular surgeon will take particular care to ensure there is no evidence of any bleeding at the neck wound after completion of your carotid endarterectomy. Your vascular surgeon will also usually insert a small suction tube called a “drain” to take away any blood from the operative site. You will be able to see this small tube coming out through the skin just below your surgical wound. Although bleeding following your surgery is infrequent (<5%), any bleeding in a neck wound can have serious consequences and may warrant re-operation (<1%) as a precaution to assess and treat any areas of bleeding which can lead to serious breathing problems. Bruising – can occur after any surgical intervention and can lead to some localised tenderness. Please do not worry about this as most bruising settles after a few weeks. Numbness – some patients may describe numbness at the neck wound or in the adjacent area particularly around the ear. This may take many weeks or months to settle. Many patients do however comment that the scar and surrounding area feels slightly different compared to their opposite non-operative side many years after their surgery. Pain – it is natural to have some discomfort after any procedure. However, your anaesthetist will provide a post-operative pain relief plan after your surgery usually involving pain relief tablets. Optimisation of pain relief will significantly assist your recovery. Scar – your carotid endarterectomy procedure will create a scar on the relevant side of your neck. Wound Infections – your vascular surgeon will pay particular attention to minimising your risk of wound infections (< 1%) following carotid endarterectomy surgery. If you notice wound redness and/or discharge or develop a temperature, it is important to report this to your vascular team if you are still in hospital or your practice nurse / general practitioner if this occurs after your discharge from hospital. Most wound infections can be treated conservatively with good nursing care, dressings and antibiotics. Early treatment is vital to minimise the risk of the infection progressing deeper. Nerve Injury – your vascular surgeon will try and minimise the risk of any nerve damage during your carotid endarterectomy which can lead to hoarseness, tongue weakness or post-operative speech and swallowing difficulty (<1%). Prosthetic Patch Infection – this is a serious but rare problem (<1%) often requiring prolonged antibiotic treatment and occasionally further surgery to remove the patch. Stroke – although carotid endarterectomy is performed to minimise your risk of a further cerebrovascular event, the operation itself carries a small risk of stroke (<3%). It is important to realise that your vascular surgeon will only offer you an operation if the perceived risk of you having a stroke from the surgery itself is lower than conservative (non-operative) treatment of your significant carotid stenosis. Cardiac (Heart Attack) – any major surgery can stress the heart. Due to the urgency of carotid endarterectomy following your cerebrovascular event, normal anaesthetic pre-assessment protocols are often superseded as any delay increases your risk of a further TIA or stroke. Your vascular surgeon will have discussed your case with the anaesthetic team to optimise your safety and surgical outcome from your carotid endarterectomy. Respiratory (Chest Infection) – although it avoids an abdominal incision, carotid endarterectomy can lead to lung complications particularly in an elderly patient with pre-existing lung (respiratory) disease. Your anaesthetist will optimise your pain relief and you will also see a chest physiotherapist as you recover. It is very important to have considered smoking cessation prior to any procedure. Thromboembolic – all patients requiring major surgery are placed on a preventive care plan to minimise clots in your legs and clots that can also affect the lungs. This may include light compression stocking combined with mechanical lower limb compression during your surgery and injection of blood thinning medication throughout your hospital admission. Mortality – all major surgery carries a mortality risk. 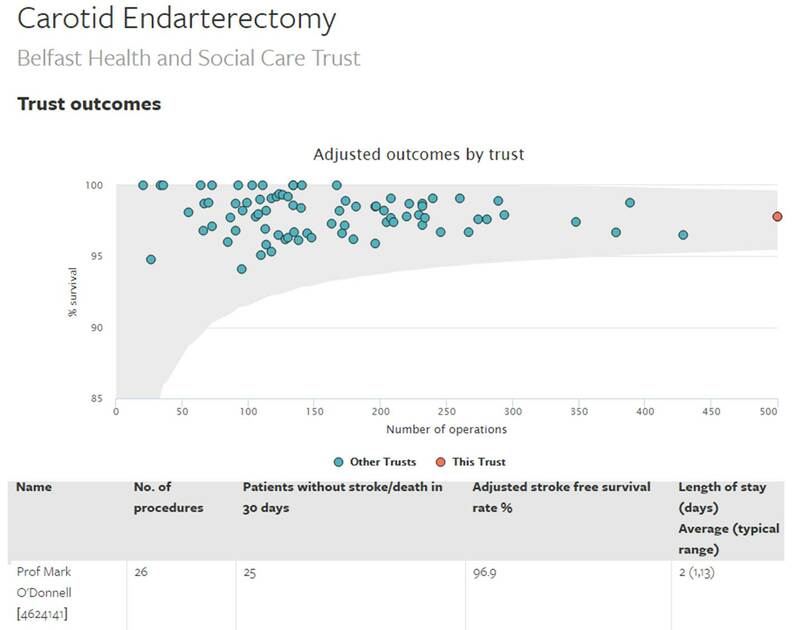 This is why your vascular surgeon will be extremely particular about all facets of your care during your carotid endarterectomy to minimise mortality risk (<1%). All surgeons within the UK submit their outcome data to the National Vascular Registry. What are the time-scales from cerebrovascular event to carotid endarterectomy surgery? Current NICE National Guidelines for Stroke and Transient Ischaemic Attack (Section 1.2.4 – March 2017) state that carotid endarterectomy should be performed within 2 weeks of TIA or stroke symptoms developing. As described previously, there is not often time for an “anaesthetic pre–operative assessment” due to the urgency of surgery to prevent further TIA or stroke symptoms. Most patients are usually admitted to hospital the day before their operation where blood tests, an ECG and chest X-ray may be performed if not already completed by the initial referring clinician. Some patients may already have been admitted to hospital through the stroke service after their initial TIA or stroke. An anaesthetist will consult with you to optimise your medications which you may be taking for your diabetes, heart and lung disease. Your vascular surgeon will visit you before the operation and ask you to sign a consent form once he has explained the procedure to you. Most vascular operating lists require a certain degree of flexibility due to the emergent nature of clinical cases. Therefore, you may move position on the operating list from your originally planned time. Your nursing and medical team will advise accordingly. This is why all patients are fasted from midnight with no further solid food after this time. Sips of water are allowed until 6am on the day of your surgery. What anaesthetic is used when performing a carotid endarterectomy? You surgery may be performed under general or local anaesthetic. If you are having a general anaesthetic, you will be put to sleep by an anaesthetist shortly before the operation starts. Patients having local anaesthetic will remain awake and be given a series of injections to numb the skin of the neck where the incision will be placed. Patients having local anaesthetic should be aware that they may be asked to perform a series of simple tasks at certain points of the operation. These tasks include reading out words from a card, squeezing a toy or just conversing with a member of theatre staff. This is important and allows medical staff to assess how good the circulation to your brain is at any stage of the procedure. Furthermore, patients will need to stay very still during the operation in what may be a potentially uncomfortable position. How is a Carotid Endarterectomy performed? After you are positioned appropriately on the operating table, the neck skin area where the carotid stenosis is present is shaved (if required),cleaned with aseptic fluid and surgical drapes are then applied to maintain a sterile operative field for the operation. An oblique incision is performed in the neck to expose the carotid artery and the arteries that it eventually divides into where the carotid stenosis is present. Blood thinning medication called heparin is then administered via one of your veins by the anaesthetist. Clamps are applied above and below the area of narrowing that has caused your symptoms. The artery is then opened and subsequently cleaned out to remove the diseased area that caused your TIA or stroke event. Once your surgeon is content the roughened and narrowed diseased segment has been addressed an “artificial” patch is then sutured in place to repair the artery, maintain good flow and minimise risk of future narrowing. Throughout the procedure, blood supply to the brain is maintained by the carotid artery on the other side, the two vertebral arteries at the back of the neck combined with the use of a plastic tube called a “shunt” on the operative side that is used to detour blood to the brain around the artery that is being repaired. Once the patch is sutured in place, the clamps are subsequently removed from the artery to make sure there are no leaks from the patch. When your vascular surgeon is satisfied that normal blood flow in the artery has been restored, the wound is then closed with layers of sutures. The skin sutures are designed to dissolve by themselves and do not require removal. Sometimes your vascular surgeon will use skin clips instead to close the wound which then require removal between 5 and 10 days following your surgery. Finally, a drainage tube will be placed inside the wound and emerge through the skin slightly lower than your incision. It will be attached to a bottle and the amount of fluid draining subsequently will be monitored. The operation is now complete and you will be taken to the recovery area. The operation takes between 1 to 2 hours. What happens after your carotid endarterectomy? You will be observed closely in the recovery area for anything up to 4 to 8 hours after your operation. The medical staff will assess your clinical status by asking you to open your eyes, stick out your tongue and move both your upper and lower limbs. The nursing staff will continue to check these clinical parameters as well as your pain levels, drain output and haemodynamic observations particularly your blood pressure. If there are no problems, patients are then transferred back to the ward where they are offered something to eat and drink and encouraged to mobilise the following day. The drainage tube is usually removed the morning after your surgery if only a small amount of blood stained fluid has collected. Most patients will have their normal diet recommenced the evening of their surgery with prescription of their normal medications particularly clopidogrel and statin therapy indefinitely. You may require an evaluation by both the physiotherapy and occupational therapy teams prior to your discharge to ensure you are safe for discharge. Patients are discharged 1 to 2 days following their surgery. On discharge, most patients do not require suture removal. Once the wound is healing nicely the dressing does not need to be replaced. Occasionally, you may be advised to contact your practice nurse for blood pressure checks as optimal control is exceptionally important following your surgery. Do I have to limit any activities following discharge from hospital? Normal activities and low grade exercises like walking are encouraged once you get home. It is advised to avoid strenuous activity for 2 weeks after the operation or until you feel you are able. After a single cerebrovascular event, you should not drive for 1 month. However, if you presented with multiple cerebrovascular events over a short period of time, it is advised that you should not drive for 3 months. You should also notify the Driver and Vehicle Licencing Agency and consult with your motor insurance company. The majority of patients having the operation have retired but those still in employment should have at least 2 weeks off work. When am I reviewed following hospital discharge? Your vascular surgeon will organise a follow–up appointment for you approximately 6 to 12 weeks following your surgery to assess your recovery. Most patients are discharged from the vascular surgery service at this stage. Your stoke physician may also arrange to review you as well following your surgery. You may feel tired for a few months after your TIA, stroke and subsequent operation. You should gradually improve over time. Most patients comment that they return to normal approximately 3 to 6 months after their procedure. However, your recovery is very dependent on how your initial TIA or stroke affected you. You should be able to bathe and shower lightly whilst your wounds are healing. It is not advised to fully immerse non-healed wounds in a bath until they are fully healed. Following your surgery and prior to your discharge, you will receive support and advice from many members of the vascular team including physiotherapists and occupational therapists regarding activities appropriate for you during your recovery. Additional home support on discharge can be discussed with the vascular surgery social worker.